Works from throughout the African continent, with an emphasis on sub-Saharan regions, including architectural elements, ceremonial and ritual objects, costumes, textiles, and sculpture dating from ca. 500 BCE to the present. Ceremonial objects of the cultures of the Pacific, currently with an emphasis on the islands of Melanesia, dating from the 19th and 20th centuries. Komo is a secret society whose mission is to protect the community from antisocial or dangerous events or individuals, some thought to be "witches." The horizontal mask, worn only by the association's leader, is said to devour witches like a hyena. The antelope horns projecting from the back of the head symbolize the power of the bush (that area of wilderness beyond the boundaries of human activities in the village and yelds). Feathers are added to the mask to incorporate the knowledge and divination powers of birds, who soar in the heavens, and owls in particular, who have special vision to seek out prey and hunt at night. Ukara cloth is a primary emblem of the Igbo version of Ekpe, a powerful secret association that originated in the Cross River area among the Ejagham people, eastern neighbors of the Igbo. 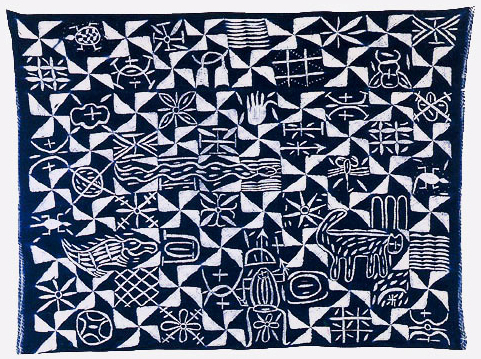 Indigo-dyed cloths with designs derived from the secret Ekpe script called nsibidi are known in other areas, but ukara is a distinctly Igbo version. The cloths are made for individual members of Ekpe's highest rank, who choose the designs and motifs that serve as a personal "signature" on their particular cloth.Ukara is usually worn as a wrapper but may also serve as a wall hanging, a banner, or part of a masquerade costume for Ekpe performances. Upon the death of the owner, the cloth may be used to construct a symbolic Ekpe house (the spirit meeting place) for the funeral. To create a fabric the proper size for its intended use, lengths of European-made white cotton cloth are stitched together. The fabric for a banner may be long enough to cover an entire wall of an Ekpe house. The patterns are drawn on the undyed cloth and then tightly stitched with coarse raffia fiber. When the raffia is removed after dying, the designs stand out as fuzzy white lines against the deep blue background. Nsibidi signs alternate with geometric patterns symbolizing the leopard spirit of Ekpe. Some motifs cut across the grid of squares, notably the leopard and the costumed masquerader. The carvers of Owa Riki are famous for their large ritual bowls, like this one in the form of a bonito canoe. Personal bowls such as this and larger communal bowls are used in commemorative feasts honoring selected deceased relatives and personal tutelary deities. The inlay comes from either the nautilus shell or the conus shell, depending on the thickness. It is held in place by putty made from oily local fruit. The bowl is painted with a resin-based black stain. The patron cannot pay the carver in currency because that would offend the tutelary deity to whom the bowl will be dedicated. The larger communal bowls are kept in canoe houses with the sacred bonito canoes.